Until Yasahiro’s ex-fiancée is murdered! Her tea shop is a week away from opening, she and Yasahiro have planned a trip away, and the future is looking bright and hopeful. But when Yasahiro’s ex-fiancée, Amanda, shows up unexpectedly, demanding his time and presence, all of their plans dissolve. Amanda is tough and drives Mei up the wall, so it’s no surprise when Mei tells her to get lost, only for Amanda to be murdered a few hours later. Yasahiro becomes the prime suspect, and Mei must put everything on hold to help free him. Following Amanda’s past through her digital footprint, Mei uncovers secret lovers, shady business deals, and the biggest secret of all, why Amanda and Yasahiro broke up in the first place. 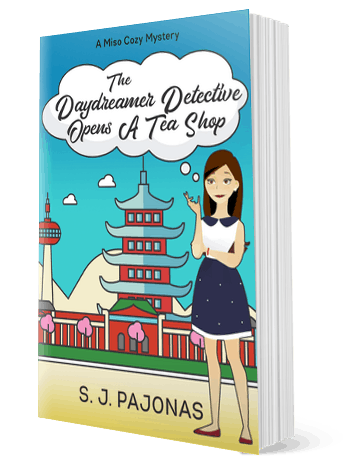 With everyone turning against her and the case under media scrutiny, tracking down the killer becomes an obsession Mei can’t give up. 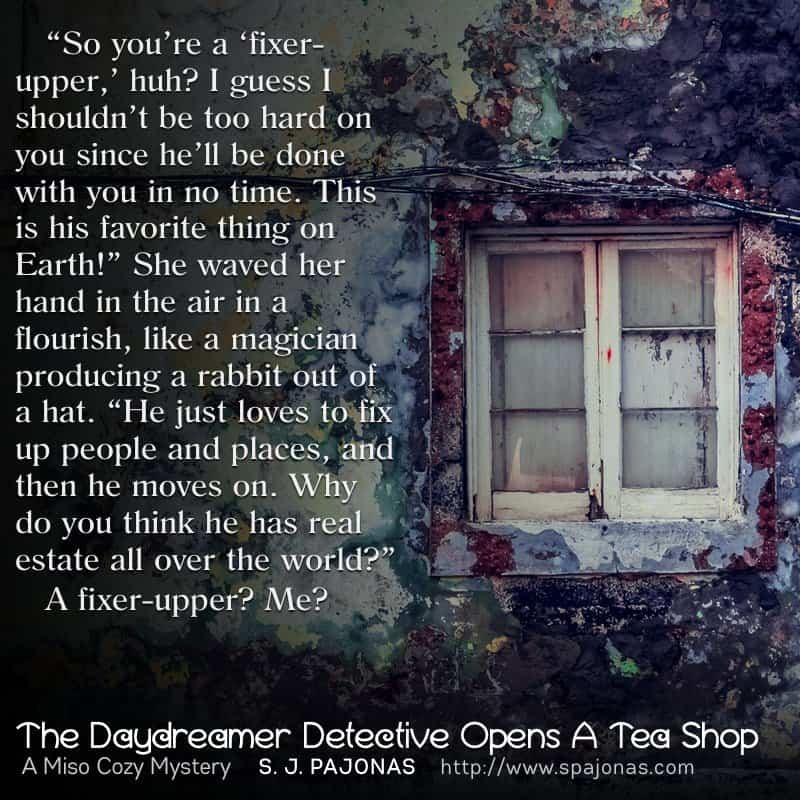 There’s no turning back, though, because solving the murder means getting her life back. Not solving it means losing everything forever. 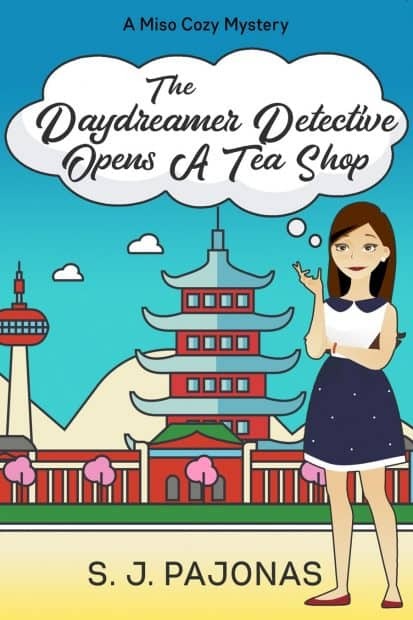 With her head in the clouds and a taste for solving crime, you don’t want to miss Mei in The Daydreamer Detective Opens A Tea Shop, the hearty third course to the Miso Cozy series of cozy mystery novels. The shovel sliced into the earth with a solid crunch, and everyone broke into applause. As the president of Midori Sankaku lifted the spade full of dirt to the cameras, he laughed, excited to be at this stage. It had been three years in the making, but the groundbreaking ceremony for the new greenhouse was finally taking place, and soon, many more new people, businesses, and traffic would grace our small town with their presence. I smiled and clapped with everyone, a burst of pride for my tiny community lifting my chin. Chikata had gone from dilapidated and dying five years ago to renewed and prosperous. People in the surrounding towns and prefectures were sitting up and taking notice. It had been a long time since a farming community in Japan had turned itself around, and we were leading the way for other communities to accomplish the same goals. “Thank goodness this is really happening. I thought I’d never see the day,” Mom whispered, continuing to clap and smile at the surrounding people. “Indeed.” There were several times in the past year I was as good as dead, so being at the groundbreaking ceremony meant a lot to me. Everyone was here today except my good friend and neighbor, Akiko. Mom’s friend, Chiyo, stood next to us with her son, Goro and his wife, Kumi. Goro was also accompanied by his partner, Kayo, and other members of the Chikata police force. We all exchanged happy smiles as the applause died out. I turned to Yasahiro, my boyfriend, the head chef and owner of Sawayaka, our famous slow food Japanese restaurant in town, and threaded my arm through his, squeezing and resting my head on his shoulder. For once, the weather was calm, and the sun shone upon us, even if it wasn’t warm yet. Spring had come to Japan. The cherry trees around town had bloomed a month ago in April and now held small green leaves on their branches. Today, we’d be content with sunny skies and a light, cool breeze. Yasahiro lifted his chin and smiled, but he kept his attention on the podium as another Midori Sankaku representative spoke of the opportunities their business would bring to Chikata. It was a good speech, and I held a lot more faith in Midori Sankaku than I did a few months ago when they arrested Fujita Takahara for killing Etsuko. In my mind and in my heart, I needed to separate the two. It was horrifying what Takahara had done, but his actions had nothing to do with Midori Sankaku. We clapped again as the speeches concluded, and everyone dispersed to walk the twenty minutes to the park at City Hall. We walked beside Kumi, her hand on her hip and a grimace on her face. She was in her second trimester of pregnancy and already experiencing the aches and pains of carrying a baby. Her belly had rounded and so had her cheeks, but she loved being pregnant because she wasn’t too sick, just in pain. “Shall I go get our car?” Goro asked, squeezing Kumi to his side and helping her. “That book we read said your joints will loosen up on their own.” Goro, always the student, had been reading all the pregnancy and baby books he could get his hands on. Whenever I visited him at his desk at the police precinct, he was poring over another book, marking pages with post-it notes and highlighters. When we reached the park, we set out a blanket and sat in the sun. Mom and Chiyo popped open their picnic baskets and handed out drinks and rice balls to everyone. “Now I suppose I’ll be hearing a lot of construction in the next couple of months,” Mom said taking a bite of her rice ball and staring off toward home. The new greenhouse when completed would be on the cleared land closer to town. Administration buildings for Midori Sankaku would be located on Akiko’s back farmland. In January, Akiko sold her farmland but not the house. As a full-time nurse, she didn’t have time to tend the fields anyway, but it would take many months for the details to work out. The administration buildings wouldn’t be built for another two years. “Where is she again?” Mom asked, pulling more boxes of food from her picnic basket. I took a moment between bites to stretch out my arms. Mom and I had spent the morning in the fields, turning the soil, adding compost, and preparing for a second planting. I lived at home during the week, working most mornings outside, and then spending my afternoons in town getting my new tea shop ready for opening in two weeks. My body ached in places I didn’t know existed. “Did you hear from my contact in Kumamoto?” Goro asked Yasahiro, passing him a pair of chopsticks and a bento box. Usually it was Yasahiro handing out the food, so it was nice to see him get a break for the day. Yasahiro and I were both struck by the hardship of everyone in Kumamoto during the earthquake in April, so we decided to volunteer with relief efforts once we aligned our schedules. Though it wasn’t the best time to drop everything and go (I still had plenty to do to get the tea shop up and running), it was better for us to volunteer before the tea shop was open for business. I would be the tea shop’s only employee for the first year, so vacation time would be minimal. “I felt it was my duty to go, to help in some way. I’ve been very fortunate.” When Yasahiro spoke this way, my heart grew three sizes. It was something I loved about him. He knew how good he had it, but he never took that for granted. “Me too.” I squeezed his knee, but he laughed. Probably because he wanted to argue with me again about how I needed to be more self-ish not self-less. But he knew that wasn’t me. I’d always put his or other people’s needs in front of my own.